KABAYAN Party-list Representative Ron Salo lauded the DepEd over the weekend for its move to enforce intellectual priority rights laws in campus journalism. Salo, a law professor, is a current Vice-Chair of the House Committee on Basic Education and Culture. Salo hailed the new DepEd guidelines for the 2018 National Schools Press Conference (DepEd Memorandum No. 200, series of 2017) for its stricter provisions against plagiarism. The memorandum was issued last December 12, on which date selected school paper advisers from different regions were assembled in Palo, Leyte for several days of their annual training of trainers. Those teachers are still in Leyte as of now, stranded because of Tropical Storm Urduja. “Any school paper found to have copied and published texts, images, and other materials without duly acknowledging their sources should be disqualified in the contest,” the DepEd directive states. DM No. 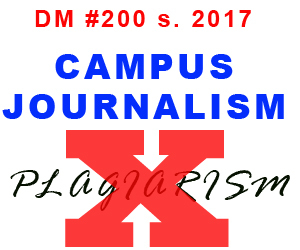 200 further provides that another plagiarism offense in 2019 will be met with a written reprimand, a refresher course on plagiarism, and instructions to the concerned principal “to teach students about the ills of plagiarism and its consequences.” Yet another repeat offense will be meted disqualification from the NSPC for three straight years, according to the DepEd guidelines. Competitions will be held from February 19 to 23, 2018 in Dumaguete City. Each region is expected to send 290 delegates of students, teachers and officials. Campus journalists who won at the regional level will wield their pens, pencils, cameras, laptops, and other tools in team contests on TV broadcasting, radio broadcasting, collaborative desktop publishing, and online publishing and in individual contests on news writing, sports writing, feature writing, editorial writing, science and technology writing, photojournalism, editorial cartooning, and feature writing. Most outstanding campus journalists and school paper advisers of each region will be recognized in Dumaguete.